It’s been a really long, long time since I last posted an article in this blog. There’s been a lot of great things happening in my life that I haven’t really found the time to write all about it. One thing I realized is that when you’re having the time of your life, it can be a challenge to take a moment to reflect and appreciate everything. Now, I finally found the time. Today, I’d like to share with you THE MOST SPECIAL blessing I’ve received in my entire life…the birth of my first born son, Ethan Gabriel. This early our baby boy Ethan Gabriel is growing up to be a strong and healthy kid, thanks to a lot of prayers and a miracle from God. The past few weeks has been a whirlwind adventure of holding on to the promise of God’s hope, of witnessing a great miracle, and of experiencing a deep and profound appreciation of all of God’s blessing of time and spending it with your loved ones. Last April 10, 2012 marked the day a series of unexpected events started to happen. It was my wife’s birthday. And it happened to be the same day as her prenatal checkup. To celebrate her birthday, I treated her to an early lunch at the Heat Restaurant in EDSA ShangriLa. We had a really great time, enjoying the sumptous meal together. After our date, we went to the clinic for her prenatal checkup. It was supposed to be the last prenatal checkup before she’s due to deliver. She was 36 weeks pregnant, a week away from being full term at 37 weeks. It was supposed to be like any of the other almost a dozen prenatal checkups my wife have had the past 9 months. Nothing could have prepared us from what’s about to happen next. While doing her checkup, the doctor noticed my wife’s unsually high blood pressure. It was 140/120. My wife also thought it was just a mistake because her blood pressure was normally at 110/70 on her previous checkups. She was not feeling nauseous or anything. She felt normal. When her doctor asked her to have her blood pressure taken again to make sure and to take a urinalysis test, my wife was worried to say the least. And when the doctor explained to her that if her blood pressure is really that high then she might have to be admitted to the hospital right away. My wife was shocked. And it showed very clearly. My wife’s blood pressure shot up to 160/120 in an instant. She never imagined that she’d get admitted to the hospital and might get into labor ahead of time. My wife’s doctor diagnosed her with pre-eclampsia, a rather critical condition for pregnant women. The doctor asked us to immediately get admitted to the hospital. So, with shocked and worried faces, we went directly to St Luke’s Medical Center in Global City. My wife was admitted to the High Risk Pregnancy Unit of St Lukes. She was immediately given medication to stabilize her blood pressure, the hours went by which seemed like a very very long time…each time her blood pressure is taken, my heart stopped. I held my breath as I await the next reading of her blood pressure. Still high at 160/100…and then getting even higher at 180/110…my heart bled in worry as if each moment was being frozen in time. I was worried. I knew my wife was worried not only for her sake but more for our baby’s condition. After more than a day of torture, my wife’s blood pressure finally stabilized. The doctor even contemplated of sending her home. But because a pre-eclampsia condition is very critical, not only for my wife but also for the baby, the doctor requested staying for a few more days. This way, my wife and the baby’s condition can be closely monitored. I thank God to this day that we heeded the doctor’s advise and stayed in the hospital. The following morning, everything seemed normal. Little did we know that the nurses were already getting a bit worried. At about an hour before noon, the attending nurse seem to check my wife and the baby’s vitals signs a little more frequently at about every 10 minutes or so. Each time the nurse came by, a little bit of worry crossed my mind, curious why suddenly the nurse’s actions looked a bit more hurried. I wanted to ignore it so that my wife won’t be concerned. After another hour, the nurse once again entered the room but this time to hand me over the consent form for my wife’s emergency caesarian delivery. Panic-stricken, I managed to ask why. She explained that the baby’s heart rate has been dropping every 10 minutes or so and our doctor advised an emergency caesarian delivery right away. All they needed before proceeding was my signature for the consent form. After signing the document, the nurse hurriedly prepared my wife for the emergency operation. Everything happened so fast. Next thing I know, my wife was already being transferred to the delivery room and I was trying to put on the scrubs on to be with her in the delivery room. I was scared. But I needed to be strong both for my wife and our baby. I tried to reassure her that everything will be alright. We both needed to have faith. Perhaps, I needed it more than she did so I can have the courage to go through what’s about to happen next. When the baby came out, I was both relieved and anxious at the same time. Relieved because my wife has safely delivered our baby. Finally, my wife can now sigh a relief and concentrate on recovering from the operation. Anxious because when our baby came out, the baby was under a lot of stress. Our doctor said that the umbilical cord of the baby got entangled on his neck causing him a lot of stress during the delivery. Considering that he has not yet reached full term, it was very critical that he becomes stable first. When the doctor tried to make our baby cry, his crying was very weak and his skin color was not very good. Our baby was handed over to the pediatrician right away. Our baby was having a hard time breathing because of all the stress that he went through. After our baby stabilized and was able to breath better, he was weighed in. He came out at 2,190 grams which is only a little over 4.8 pounds. After another 5 minutes, the pediatrician heared a little murmur from our baby’s heart. The pediatrician decided to consult a cardiologist right away and transfer our baby to the Neonatial Intensive Care Unit of the hospital. My initial sigh of relief was flustered with a very worried face. After what seemed like a lifetime of waiting, the cardiologist did a 2D Echo on our baby’s heart and the look of worry came over his face along with all the other doctors once they saw what was happening. I was trying to calm myself down but I couldn’t have imagined going through something like this in my life. The doctor asked to speak with me in a room so he can explain it to me better. Good thing my in-laws were there with me when the doctor explained it to me. At the end of the conversation, my face turned from worry to desperation. The doctor explained that his diagnosis is pointing to a problem in our baby’s heart described as coarctation of the aorta and he might need to undergo surgery to solve the problem. My father in-law mustered enough courage to ask what were the chances of the baby surviving an operation like that. The doctor responded with a reassuring voice that it’s probably around 70/30. He explained that it’s a very delicate operation because it involves the veins of the heart, and also because the baby’s veins are very tiny. To which my father in-law asked again, how much would the operation probably cost? The doctor answered, "perhaps around P700,000 or so." I couldn’t even utter a single word at that point. I was shocked. I didn’t know what to do. Not only because of the HUGE amount, which is also shocking, but more for the well-being of our baby and my wife who was still in the recovery room at that time. There were so many "what-if" scenarios, fears and worries going through my mind. I didn’t have the strength to speak a single word after that. The next few hours were the most trying moments in my life. I was advised by the doctors not to share the information with my wife because it might trigger her high blood pressure to shoot up once again. She needed to be stabilized first. At this point, I didn’t have anyone to turn to. I had to be strong both for our baby and my wife. But I couldn’t help myself. There comes a point in your life when you can’t do anything else other than to TRUST GOD that HE KNOWs what you are going through, and HE WILL MAKE A WAY. I excused myself from my in-laws and went to the hospital chapel alone. Not only to pray but to cry out for help from the Lord. I was like a helpless child crying out to his father in heaven to "please help our baby". It was all I could do. I wish I could say I was strong, but I was not. I was scared as hell. The hours that passed seemed to take a life of its own. Our cardiologist was searching from the different hospitals and his contacts for a hard-to-find medicine that would temporarily help our baby’s heart and prevent it from crashing down. He wanted to transfer the baby to Philippine Heart Center that night, but after checking out the baby’s condition at the NICU, and a rather very fortunate event of him being able to get hold of the medicine from another doctor of PGH, he decided to postpone the transfer until the next morning. At about 8pm that night my very kind brother-in-law helped drive me to PGH to buy the medicine. He even offered to lend me the cash because I was still in state of shock aimlessly trying to look for an ATM to withdraw from. I don’t know if it was divine intervension, but I realize looking back that God’s miracles was already working it’s way at that point in time, and that perhaps that doctor in PGH was a god-sent angel from heaven. After two-hours of waving through traffic going to and back from PGH, we arrived in St Lukes with the medicine on hand. The medicine was given to our baby immidiately. 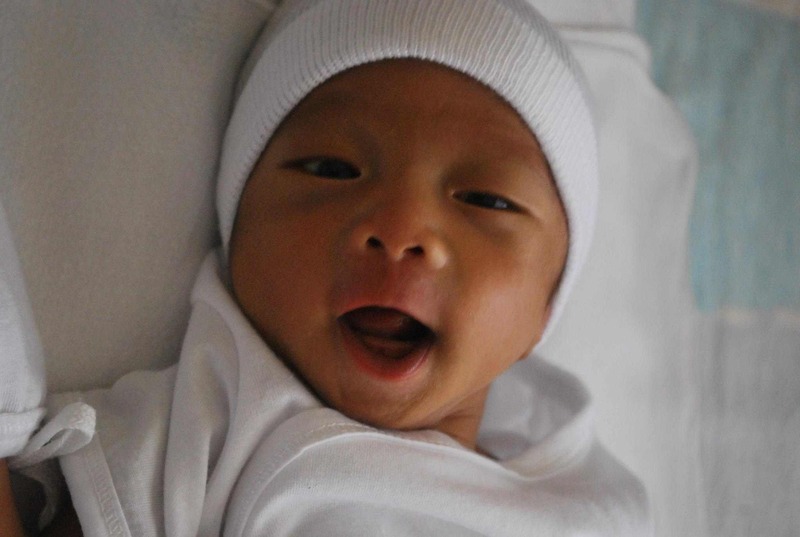 At 11PM, we asked if there’s someone from the St Lukes Chapel who can help us bless our baby boy Ethan Gabriel. Fortunately there was a resident pastor who’s available at that time. Pastor Chris came by and together with my sister and brother in-law, we prayed over our baby and for God’s healing to be upon him. Pastor Chris and I chatted a little bit afterwards and his message of hope for our baby was very reassuring. Up to this day, I am grateful for Pastor Chris for being there in our most trying time. Our friends in XTRM 1-11 also came by to visit and offered to pray over baby Ethan Gabriel and my wife Anna as well even if they couldn’t enter the room because it was already 2AM in the morning. Sleep-deprived. Shocked. Restless. I tried to rest and sleep aftewards but my mind and body was simply too worried to get a decent sleep. At 8AM, my mom who recently arrived from an overnight trip all the way from Ilocos came with me as I visited our baby in the NICU. When we arrived, the cardiologist was busy doing another 2D ECHO on our baby, and he signaled for us to wait outside and he’ll speak with us after checking our baby’s condition again that morning. While anxiously waiting for the result, I was busy praying under my breath for our baby’s miracle recovery. After seemed like a lifetime of waiting, the cardiologist came out of the NICU, his face beaming with delight as he puts his 2 thumbs up sign and walks over to where my mom and I were standing. He said, "Great news! It looks like your baby doesn’t have to go through surgery anymore." All I could say was "THANK YOU LORD!!!" The cardiologist explained that overnight our baby’s condition improved significantly to a point where the initial diagnosis of coarctation of the aorta was no longer evident. The narrow nerve that was supposed to be operated on improved and was now pumping blood from the heart normally. It looked like the medication that they gave to our baby helped improve his heart’s function overnight. All I could utter at that point was, "THANK YOU LORD", over and over and over again. When the cardiologist waved goodbye, he said, it looked like OUR PRAYERS WORKED! And it worked indeed! Up to this day, I still don’t know what happened. It was a MIRACLE! To God be the Glory! Until now, I can’t seem to thank God enough for giving us a GREAT BLESSING in our first born son Ethan Gabriel. Prayers really work. To our family, friends, and all other people in our community, my in-law’s Lifers community, my brother-in-law’s Light of Jesus community, our XTRM 1-11 family, and all the countless people who helped prayed with us that night and continued praying for our baby’s recovery, my heart will be forever indebted to you for your kindness. God bless you! The experience reminded me once again, that every blessing comes from God. Each moment that we are living is a gift from the Lord. No matter how prepared you think you are, no matter how confident in your abilities you may be, no matter how financially secure you believe you are, God can take everything from you in a snap of a finger. Every riches, financial or otherwise, are only an accessory to the real riches we have in each of us all — a loving God who knows the desires of our hearts even before we are able to speak them. My hope is that our baby Ethan Gabriel’s story help encourage you to hold on to God’s promise of hope in whatever challenges you are facing right now. God knows the desires of your heart. And just like a father who loves, He will surely bless you in ways you can never imagine. Miracles do come true. God bless you. Congrats! Sir, I had a similar case as yours. I happen to be a doctor and had a very stressful pregnancy. However, at 34 weeks, my OB decided to perform emergency CS because of the deteriorating heart rate of my baby. She also had her umbilical cord entangled all over her. Next thing we knew, she also had a heart problem, a brain problem because of lack of oxygen, an immune system problem, and digestive problems. I couldn’t believe what was happening! I knew I prepared for this pregnancy well. Anyway to cut the story short, my husband and I prayed hard. And God really knew how to show that He listens. That premature girl is now 19 years old. A beauty and a genius. Too bad, my husband died when she was just 12. I am sure that in spite all the obstacles we have right now, He will surely answer our prayers. Yes, in His time. thanks doc Jhenn for sharing your story. indeed miracles do happen. great to hear your daughter turned out well! God bless you and your family.